Aroi is on the corner of Denmark Street just at the start of O'Connell Street. Street food is the thing people talk about when they return from the Far East. Those morsels of spicy deliciousness cooked and sold from stalls in markets and on the streets for no more than a few cents. Foodies waffle too about street food in Ireland, of which we really have very little, but let me tell you if you want to experience authentic Malaysian, Indonesian, Vietnamese and Thai street food at great prices treat yourself to a trip to Aroi Asian Street Food, just opened in Limerick. 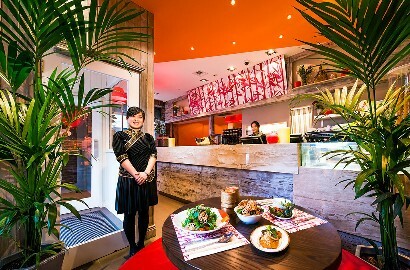 Aroi has been opened by chef Eddie Ong Chok Fong and his delightful Chinese wife Jenny and the denizens of Limerick are enjoying a real treat. Fong has worked in many countries and his wife told me, as we sat there chowing contentedly through a myriad of exotic flavours and textures, that he has worked in 5 Star hotels and is experienced also in the art of French cuisine. On emerging through the kitchen curtain to enquire as to our food, Chef Fong told me he is half Thai half Malaysian. He grew up in a street food environment in Bangkok where from a young age he was helping his mother and grandmother make noodle soups for the thousands of people flooding the streets of the city on bicycles heading to work. After school, it was then back to work for young Fong in the busy noisy kitchens of a restaurant. So this man has grown up with food, it is in his genes and it shows. What struck me immediately was the sour sweet fresh element so often dumbed down for European palates and I hope they stick to this principle because it is this difference that makes Aroi so special. All of the dishes from Sides, Curry, Stir-fry, Grilled, Rice, Wok Noodles, Noodle Soup are incredibly cheap and good value as are juices, cha, beer, soft drinks and wine. You can literally dine here like the King of Siam and still not break the bank. The décor is Asian diner style with a long banquette running down one sidewall and a handful of booths on the other. Pretty pink bamboo pattern table runners and menus, add softness along with Asian artifacts and pictures. We picked a few sides as a starter selection and, as I write this article, I only wish I was sitting down to them again! A trio of terrific fish cakes were on a Thai tomato sauce topped with sweet sour pickled cucumber, slices of red chilli, and scattered with chopped peanuts, whilst Mou Bing had succulent tender chargrilled pork chunks coated in a sour sweet tamarind sauce which also prompted me to ask about the chef’s Indonesian influences. Thai calamari was not of the pale anaemic variety we see so often, but lusty brown melt in the mouth curls, resting on a banana leaf, dressed with those little mighty red hot birdseye chilies, crushed peppercorn, lime leaves, a section of lemon and a ginger dressing. Likewise a brace of Porpia Bpet Tod had crispy duck rolls with sweet chilli sauce, cucumber pickle and chilli. We then moved on to wonderful Pad Se-lew with its ribbons of thick silk noodles tossed with stir fried delicious Thai green vegetables, pak choy, green beans, slivers of pork – it was just so good and so healthy with all of those amazing green vegetables. Chargrilled breast of duck was equally divine, sitting on another bed of fab fresh green vegetables. The skin was dark succulently sinful, the meat was melt in the mouth gorgeous and all coated in that divine tamarind sauce. Another outstanding dish was their Som Tam salad a wonderful combination of fresh green papaya, cherry tomatoes, green salad, and topped with dried shrimp. We were brought colourful fun tubs of icecream – strawberry, vanilla and mint and with a coconut, carrot and orange juice. Aroi means delicious or tasty. It sure is. This place is going to be busy!